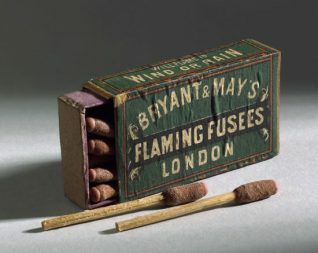 In the 1950s and early 1960s, there was a blind man who used to sell matches, from a tray that was strung around his neck. It was in the style of the ice cream sellers in cinemas. As I remember, heused to stand somewhere in the shopping area of London Road. I wonder if anyone else remembers him? Even back then and as a child, I wondered how he made a profit from what he was doing. Did someone give him the matches? How much did a box cost and how many did he sell? Surely he can’t have raised anything like the amount of money it would take to live on? I guess that it has to be borne in mind that, at that time, almost all adults were smokers. But I would guess that most people would buy their matches along with their cigarettes. This is a mystery to me. Do you know anything about this subject? If you do, please leave a message below? Hello Philip. I remember that in the early 1960s there was a blind stall holder in the Open Market (between London Road and Ditchling Road). Perhaps this was the same man? Happy New Year! Best wishes. Probably the gentleman lived on gratuities from the public when they ‘bought’ a box of matches, rather than being involved in a real commercial transaction. Many people did the same in London, and used a similar pretense, rather than beg for cash openly. Also, the police might not have been too happy about beggars in general, so it avoided a confrontation. Yes, that sounds just right, Stefan. A sort of “keep the change” arrangement. Yes, I agree it must have been a form of begging, but with the caveat that they were actually selling something! I never knew of the man in London Road, but there was an “old” woman who sold similar around the Lanes district (Ship St, Middle St, Duke St etc). One Saturday night when I was out with pals on a “booze cruise”, she accosted me just as we were making for the “Bodega” (all those glorious pubs – gone!). I remember distinctly giving her a half-crown for a box of Swan Vestas and laughing as she chased after me crying that it was too much! I must have been well sozzled! It would have been no later than 1959, when I was a young lad of 22. I have been endlessly looking for……. Sorry but your post has been deleted. We no longer allow requests for information on individuals born after 1911. I remember the little old lady selling matches at the corner of Cheapside Rd opposite Woolworth’s on the other corner. I was only very young at the time, it was in the 1940s. There might be someone out there who remembers another lady that used to sell something off a tray, she only had one leg, but when she passed away they discovered she had two. The lady in question would strap one leg up and used walking sticks to get around;they also found rather a lot of money strapped around her waist.